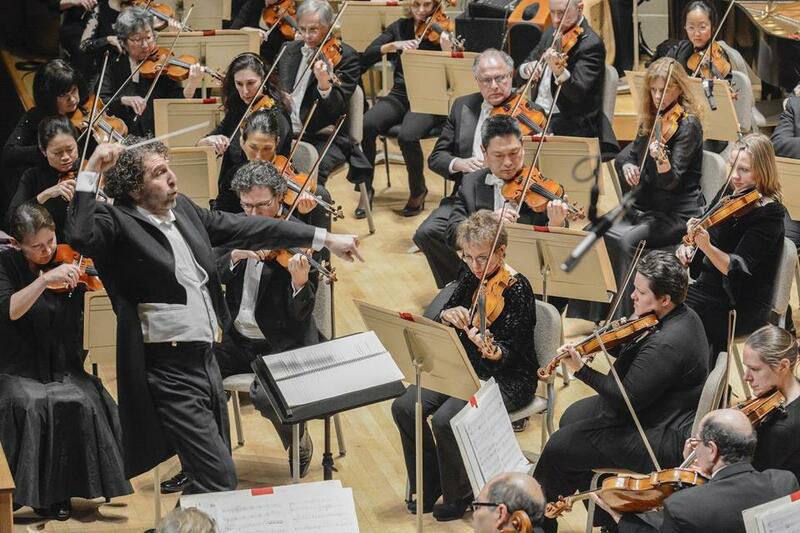 Conductor Asher Fisch made his BSO subscription series debut, opening the concert with Avner Dorman&apos;s Astrolatry. It was a refreshing change of pace this week to find that the program led by the Israeli conductor Asher Fisch, making his BSO subscription debut, included a piece of contemporary music from one of his own compatriots — in this case, the Israeli composer Avner Dorman, whose music had never been heard before in Symphony Hall. Taking a step back, isn’t there something a bit un-festive about the way guest conductors routinely journey from far and wide to lead the BSO, yet for the most part they show up with scores by the same few composers packed in their luggage? It’s a bit like the friend who travels all the way to St. Petersburg, and then brings you back a gift of coffee beans purchased at the Starbucks on Nevsky Prospect. Too often these days, in other words, a guest conductor’s nationality counts at most as a credential for interpreting standard works from a particular tradition, as with the frequent visitor Stephane Deneve and his French classics. But imagine for a moment even just a single season where each guest showed up with 10 minutes of music written by a living composer born in his or her own country. The week-by-week churn of vaguely interchangeable guests would feel instantly transformed, as would, for a moment, the whole idea of musical origins. Symphony Hall might also start to feel like a less insular place. As for this week, the new score on offer is “Astrolatry,” a brief, atmospheric tone poem that reflects on the ancient practice of worshiping the stars. The work’s opening asks the suggestive question of just what the night sky sounds like, to which Dorman replies with inventively mysterious pianissimo textures produced by double bass harmonics and marimba. The second movement reimagines the ancients’ ecstatic sky-directed rituals through a rhythmic prism inspired by contemporary electronica. Dorman has an acute ear for orchestral sonorities, and if the work’s ambitions ultimately feel rather modest, so be it. The work’s sheer presence gave the evening a different coloring. Fisch, who has championed Dorman’s music widely, led it with an insider’s authority and zeal. After Dorman’s curtain-raiser came Prokofiev’s Second Violin Concerto, in an aggressive and muscular performance by Julian Rachlin. The soloist grabbed onto the outer movements with fearless technique, but the music seemed to speak most clearly in slower middle movement, where Rachlin brought an eloquence of phrasing to Prokofiev’s disarmingly lyrical melodies. The pyrotechnics of the finale on this occasion offered plenty of light, if only a modicum of heat. Fortunately, warmth was generously supplied in the broadly contoured account of Schumann’s Symphony No. 1 with which Fisch closed the evening. Leading from memory, he drew tonally rich and organically shaped playing from the orchestra. And of course, there could hardly be better timing for a symphony that, quite literally, dreams of spring.